The first of six Louis Vuitton America’s Cup World Series events this year kicks off in Muscat, Oman, at the end of the month aboard thier one-design AC45 foiling catamarans. 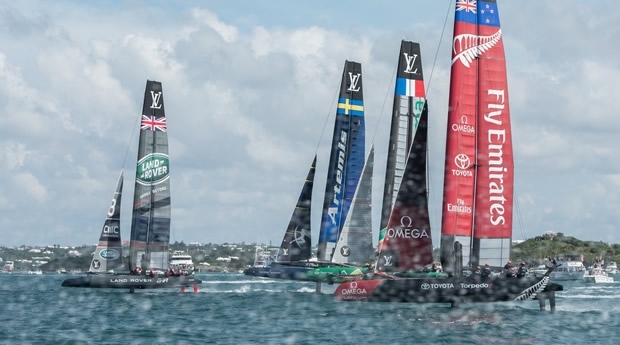 Leading the rankings after the first three Louis Vuitton America's Cup World Series events last year in Portsmouth (UK), Gothenburg (Sweden) and Bermuda is Emirates Team New Zealand, which reached the podium at all three events. This Kiwi crew looks very different from the one that was defeated at the last America’s Cup in San Francisco in 2013 by Oracle Team USA, with Peter Burling taking over as helmsman and Glenn Ashby, one of the most knowledgeable and respected catamaran and foiling experts in the world, leading the team as skipper. The current America’s Cup champion, Oracle Team USA, sits ten points behind in second place, a position two-time Cup winning skipper Jimmy Spithill will be looking to overhaul when racing kicks off in Oman on 27 February. Sir Ben Ainslie’s Land Rover BAR has been training hard on its AC45 test boats in the Solent, but the Gulf of Oman is almost as familiar to them with several of the crew, including Ainslie himself, having competed in the Extreme Sailing Series, which, traditionally, has kicked off each year in Muscat. Artemis Racing is coming off an impressive win in the Bermuda event last year. The team is led by Australian skipper Nathan Outteridge, who in August will find himself locking horns with Emirates Team New Zealand’s Peter Burling in the 49er class at the 2016 Olympics. With the America’s Cup and the Olympics to contend with, the pressures on both Burling and Outteridge are considerable in 2016, while Groupama Team France skipper Franck Cammas is fighting his own battles after sustaining a severe injury to his foot while training in December. This contributed to ending his Olympic campaign and may also keep him off the water for Louis Vuitton America’s Cup World Series Oman. The team is expected to announce whether Cammas will sail, and his possible replacement, in the coming days. Softbank Team Japan, skippered by Dean Barker, the former long term skipper of the Kiwi team, has high expectations for 2016 having completed some intensive training in Bermuda. They also welcomed two new Japanese crew Yugo Yoshida and Yuki Kasatani to the team, both hungry for success and raring to go. The six teams are scheduled to compete in six races over two days with all the action from Oman broadcast far and wide around the world. By the end of the first day of racing on 27 February, a form guide for 2016 will start to take shape. By the end of the final race the next day, a new chapter will have been written, chronicling the debut of America’s Cup racing in the Middle East and Oman’s rise as a world-class sporting venue and destination.